Floor tiling- all the information you need before getting started. You can take on the job yourself or hire us to take care of it for you. If you have any additional questions don’t hesitate to contact us. Tiles can be fixed to most floors. Before you start floor tiling make sure the surface is ready for tiles. The surface must be suitably level, sound and free of loose material. The surface should also be clean, dry and free of dust or grease. Once floors are correctly cleaned, prime with an acrylic primer and leave to dry before tiling. New concrete floors must be allowed dry for at lest 6 weeks. More drying time may be needed, depending on weather and site conditions. A new screed may shrink as it dries and this can cause cracks across the floor. If tiles are fixed before it is dry and cracking does occur it is likely that the cracks will appear across the tiles as well. Make sure the floor is dry and stable before any tiling starts. Where there are excessive bumps or hollows in the sub floor, levelling compound might be needed. Check your tile adhesive packaging first. Many adhesives can be used up to a depth of 10mm in isolated areas. If the floor does need to be levelled we recommend using a good Latex Levelling Compound. If there are very high humps in the floor, these will need to be removed. Use a Kango hammer or hire a Scrabbler to cover a bigger area. Floor tiling with larger floor tiles such as 60×60 is less forgiving and will need a smoother surface. The floor should be rigid, non-flexing and stable enough to bear the extra weight. Ply-wood floors are very prone to movement. To restrict this movement its best to lay a 2nd layer of plywood on top. The 2nd layer should be lay’ed running in the opposite direction to the 1st layer. Make sure the floor is very heavily screwed down. Flexible adhesive and grout must be used when tiling on timber floors. Any existing vinyl flooring or floor tiles must be very secure. Check to make sure the vinyl is glued fully and not just around the edges. Make sure any old tiles are not hollow underneath. Thoroughly clean the floor to remove anything such as oil, wax and grease, using an appropriate cleaner. Flexible adhesive must be used when tiling onto vinyl or tiles. If the vinyl or tiles are not secure they will have to be removed. Before tiling, damp of any kind should be treated and the source removed. Talk to a specialist if any doubt exists. The new finished floor will be raised by the thickness of the tile and adhesive. This can cause a height difference at doors where your new floor meets existing floors. Solid timber or brass/chrome ramp strips are usually used to bridge the height difference. Our floor tiles can be used over most under floor heating systems. The heating should be commissioned before tiling and switched on for two weeks. The heating should then be switched off during tiling and for at least 14 days after tiling. After 14 days, the heating can be turned on or increased at a rate of 2°C per day to the maximum temperature of 20°C. Flexible adhesive and grouts must be used with under floor heating. An expansion gap should be left around all perimeters. All wet floor areas should be tanked using a tanking system before tiling. Please refer to our Waterproofing Showers and Bathrooms Installation Guide for further advice. Care should be taken when tiling into hearths or fire surrounds. Make sure the tiles are kept at least 300mm away from contact with the flames or the main heat source. Not all tiles are suitable for use in this area. Please check with our sales team before picking a tile. It is important to have a joint between tiles to allow for movement in the structure. The width of grout joints will vary between 2–20mm. Large joints will be necessary on rustic tiles such as terracotta and slate. Between 3-5 mm is the most common size grout joint. In the end the size of the joint comes down to personal choice. Mosaic tiles – Make sure the sheets of mosaic are spaced so that no individual sheets can be distinguished after grouting. Expansion Joints may be required in very large floors. They could also be needed when continuing tiling into multiple rooms. Several other factors can also require expansion joints. As a general guide, do not tile continuously over areas with a length of over 5 meters. Fit an expansion joint to prevent stress building up in the floor. To find out more contact us. We often get called on to re-do a job after somebody else. 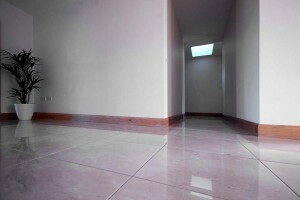 We have had countless customers whose tiles have lifted from the floor. The tiles are usually not re-useable, with the old adhesive stuck to the back of the tile. Its not worth the risk and cost of having to buy new tiles and adhesive for your floor. Your tiles are only as good as the adhesive underneath them. It is very important to plan ahead. Decide the pattern you want the tiles lay’ed in. Diamond and brick-effect are much slower to tile and create more waste with extra cuts. Take into account how the finished floor will look. 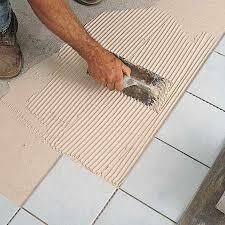 If a hall is less than three tiles wide its better to have a full tile in the middle with the outer tiles cut. If you are carrying tiling into more than one room, think how the row of tiles will look when continued into the 2nd room. Use this to decide where to start tiling. Start by marking a line along the centre of the floor. Now you must decide if you wont to centre your tiles on this line or tile either side of the line. This would leave a grout joint running along the centre of the room and is the most common method. Its important avoid a very thin piece of cut tile around the perimeter of the room. 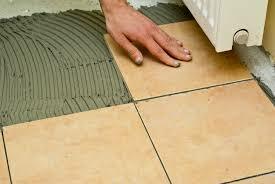 Avoid this by laying out your tiles without adhesive first to see how it will look. Start tiling in the centre of the room if you can. Its best to fit all the full tiles first. When these have set you can then go around the perimeter of the room and fit the cut tiles to complete the floor. 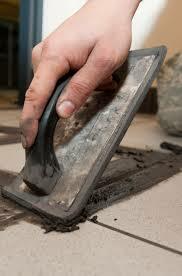 Spread the adhesive using a notched trowel. A 10mm trowel is normally used for floor tiling. The adhesive should be applied to the surface to form parallel lines. Spread only enough adhesive that remains workable. We would recommend an area of approximately 1 square meter at a time. Stone or glass tiles are normally fixed with white adhesive to prevent the colour of the adhesive ‘bleeding’ through. Push the tile home firmly with a slight twisting movement. Place the next tile beside the first, using spacers at the corners to allow for the grout joint. All the tiles should be soundly bedded in the adhesive without any space underneath. Be careful not to allow any adhesive onto the surface of the tiles or the joints between the tiles. Wipe away any excess adhesive. Once the adhesive is dry the remaining perimeter area can be prepared and cut tiles lay’ed. 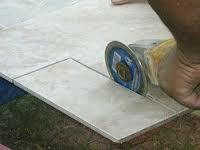 Natural Stone or any other porous tiles need to be sealed after fitting. This stops the tiles from absorbing liquids and staining. Its best practice to seal tiles before and after grouting. Before you start sealing, make sure you have read the instructions on the bottle. If you have any questions please contact us. Some sealants will enhance the colour of your tiles and others will maintain the natural colour. It is important you are sure the sealant you have purchased will achieve the desired results. If in doubt, seal a single tile first. 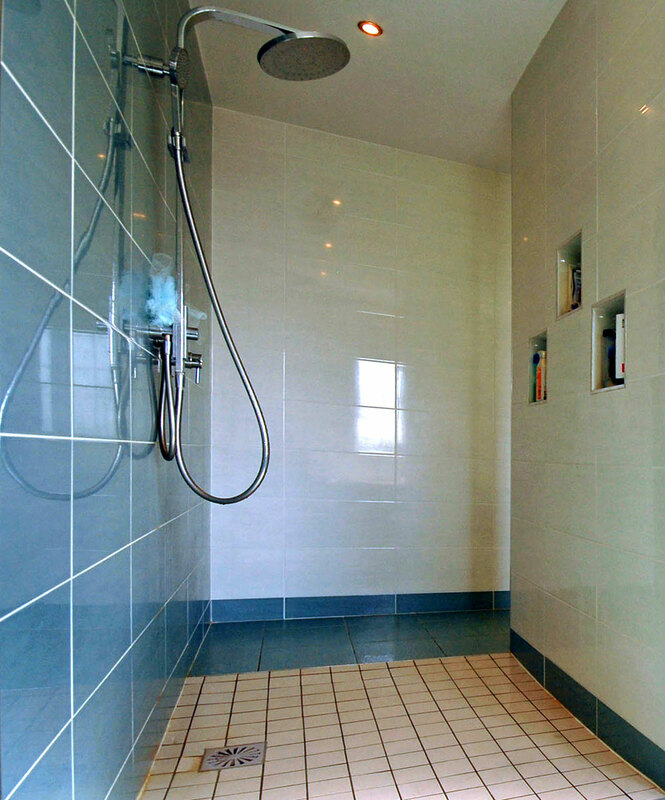 All tiles must be clean and dry before sealing otherwise you may seal in dirt or moisture. The process of sealing should be kept very clean and all materials including brushes and cloths etc should be new and unused. Make sure you use a good quality grout that’s suitable for your job. If your adhesive needs to be flexible, so does your grout. 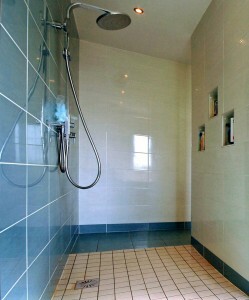 Mould resistant grout should be used in bathrooms. Wall tiling grout is suitable for grout joints from1-5mm and our floor grout is suitable for grout joints from 2-20mm. Before proceeding with your grouting, please ensure you have checked the colour of your grout against your chosen tile. Before grouting the adhesive should be fully cured. The grout joints should be clean, dry and free from adhesive and loose debris. Fast-set adhesive usually cures in 3-5 hours. Standard-set adhesive normally takes 16-24 hours to cure. The depth of adhesive and the room temperature will affect the drying time. Porous tiles should be sealed before grouting (see specific instructions for you selected tile). Very strong dark grout should not be used with light coloured tiles. A black grout could bleed through the edges of a light cream or white tile. This can cause permanent dark patches on the tile which cant be removed. Always test a small area of tiles prior to grouting the entire area. Carefully follow the mixing instructions on the back of the bag. Make sure not to add too much water. It’s very easy to go from too dry a mixture to a very wet mixture by adding just a small amount of water. Don’t mix more than you can use before it sets. Keep in mind that grout sets faster in warmer weather. The grout needs to be pressed into the grout joints and surface pits of the tile with a grout float. Take care to fully compress the grout into the full depth of the grout joints. This ensures that the joints are fully filled so no air pockets exist. Work in small manageable areas. 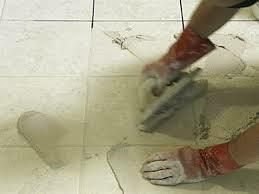 Clean off any excess grout when the grout has begun to firm up in the joints, but before it sets on the tile surface. Clean with a damp, fine textured foam sponge. Make sure the sponge is not too wet. Don’t over wash the grout as this can discolour the grout. Finish grouting in one continuous sequence to avoid colour variation. Changing the cleaning water as it becomes very dirty will also help cleaning. When the grout has set, any remaining grout can be polished off the surface with a clean, damp cloth. Use a dry cloth to remove any dust still on the surface. Perimeter joints where floor tiles meet wall tiles and at corners where wall tiles meet, must not be grouted. Instead they should be filled with a good quality silicone. This will allow for expansion and contraction in the tiles. Please note a neutral cure silicone is recommended for all natural stone. We carry all primers, adhesives, grouts and sealers to complete any job in stock. For any other issues or queries about floor tiling call into our premises in Mallow, Co. Cork. Our experienced staff will be able to address any issues you have aswell as arrange fitting if needed.